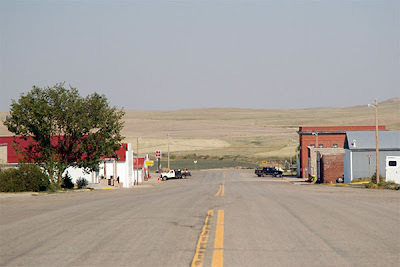 A couple of years ago, I thought it would be a fun project to take photos of small Montana towns and upload them to Wikipedia. Well, the ramshackle and biased editing I saw on Wikipedia quickly got to me, and the idea didn't last very long. I did a few such photos, though, and here's one of them: this is the Main Street of Winifred, up in Fergus County. The town has lost a lot, but there's still some things to see ... like the handsome old Milwaukee Road depot over by the grain elevators. And the country around there is some of my favorite in the state. I thought I'd heard recently that someone wrote a book about growing up in Winifred... I'm going to have to dig around about it! Whatcha got on Augusta, n' Plains...? Neat ol' towns I think. For a bigger little town I kinda liked Livingston when I visited for a few days. Too windy, but nicely restored and preserved. Courtney, if you find the title of that, let me know! I always enjoy looking at stuff like that.